School of Mechanical Engineering, University of Jinan, Jinan 250022, China. 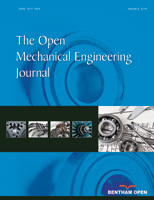 Isometric modification is proposed as a new method of axial modification of spur bevel gear. Based on the gear geometry theory and the normal meshing motion equation of gear pairs, changes of meshing points and angles are analyzed and the effect of axial modification on meshing movement of gear pairs is discussed. After that, a method of drawing spherical involute with the aid of SolidWorks software is achieved, by which the accuracy of solid modeling of spur bevel gear is improved. After solid modeling, bevel gear analysis is carried out by ANSYS/LS-DYNA software so that the contact stress and acceleration changes of driven wheel during the meshing process which was used to guide the modification of spur bevel gear can be calculated. The simulation results show that the stress distribution of gear surface is controlled by tooth modification. The load concentration, agglutination and pitting of the gear can be avoided effectively.